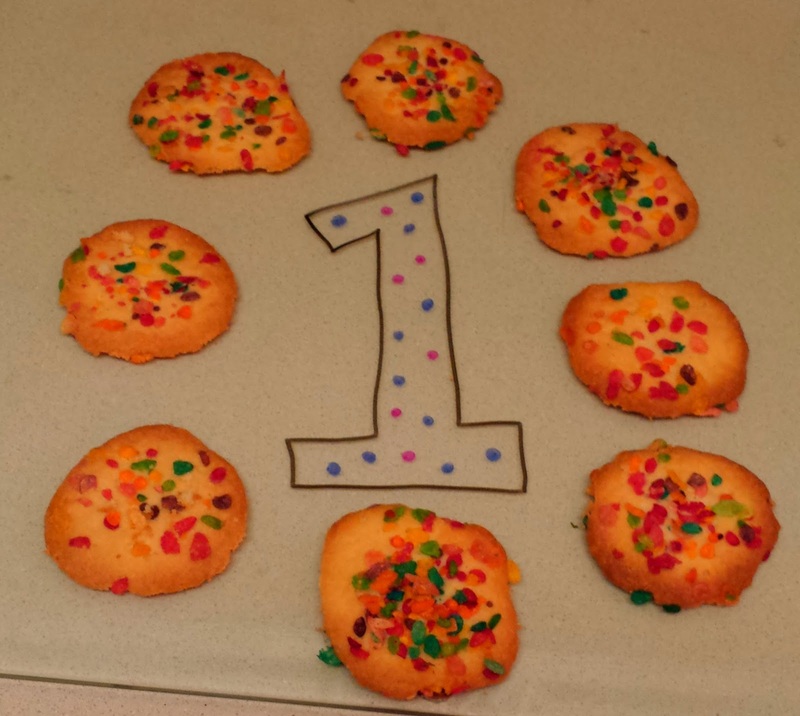 Magical Fairy Wizard Cookies: My 1-Year Blogiversary! One year ago today, I made a cheese quiche out of one of my favorite cookbooks. 83 posts (including this one!) later, Sarah Cooks the Books is a year old, and I feel like I'm finally starting to get into the swing of things. Sort of. I was going to post some stats, how many page views I've had and how many facebook followers I've managed to con into following me, but I decided that all that doesn't really matter. What matters is that you're all here, reading my little corner of the Internet, and hopefully finding some cool recipes to try to cookbooks to check out. If I'd had more foresight, I would have put together a giveaway or something. 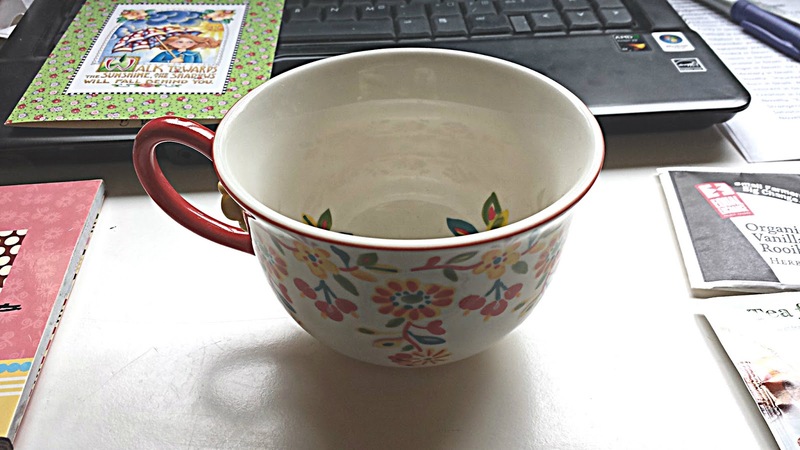 Does anyone want the second cup of Fruity Pebbles I didn't use? You can have it if you do! 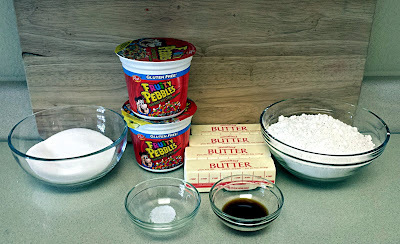 After washing out the bowl with soap and very, very hot water, I decided to hop over to one of the food blogs I follow and like, justJENN recipes, and make some cookies I'd pinned to Pinterest a couple days ago. 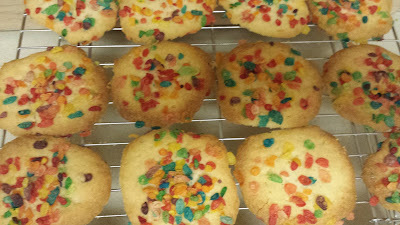 She calls them Rainbow Crunch Cookies. 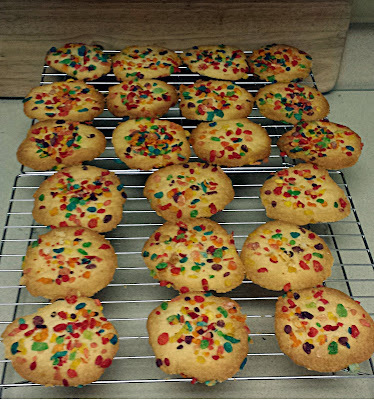 I'm calling them Magical Fairy Wizard Cookies, mainly because these things make no logical sense. For one, there are no eggs in them. 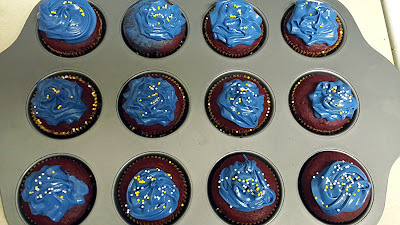 There's nothing really to bind them together, as I learned as I wrestled with the batter for like an hour. But the reason I'm actually pretty well convinced they're magical is, if you manage to take a bite of one without it falling apart, it just kind of. . .disintegrates in your mouth. It's like it was never really there. Maybe it wasn't. Maybe it wasn't six times, between Dennis and myself. Who knows? A couple of notes. 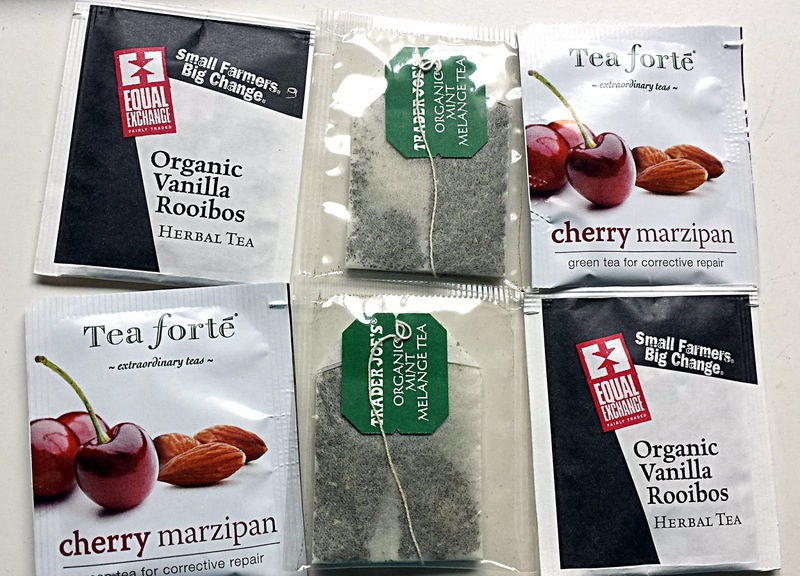 These fall apart very, very easily. Also, the batter is weird. There is no other way to describe it. It's just weird. 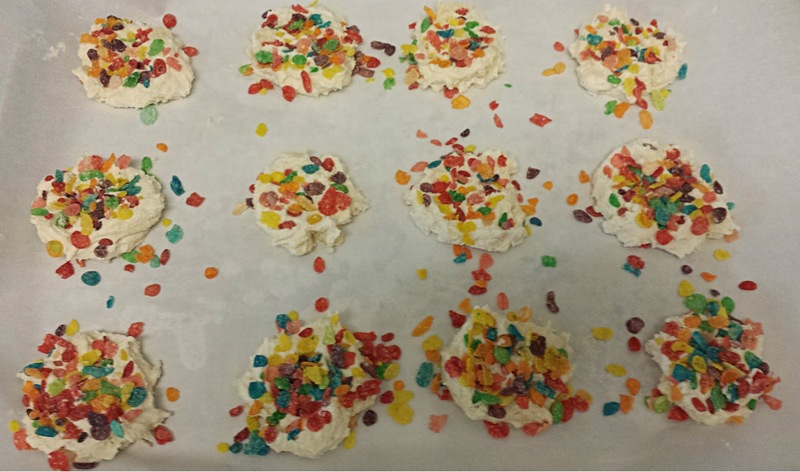 I ended up putting it in the fridge for like 45 minutes, and even then, it was falling apart on me, so I just had to make little piles of dough on my cookie sheet and kind of squish them down with the Fruity Pebbles. They're very tasty, though, and so light (even though there is a TON of butter in them), you might find yourself eating six several without really even noticing. 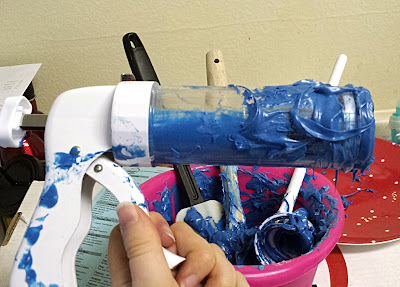 Cream together the butter and the sugar with a handheld mixer or in an electric mixer. Add flour a little at a time until combined well. I had to refrigerate the dough at this point for about 45 minutes and it still didn't really work right for me. Let it get to whatever stiffness you can work with, and that's fine. Press Fruity Pebbles into the balls of dough. 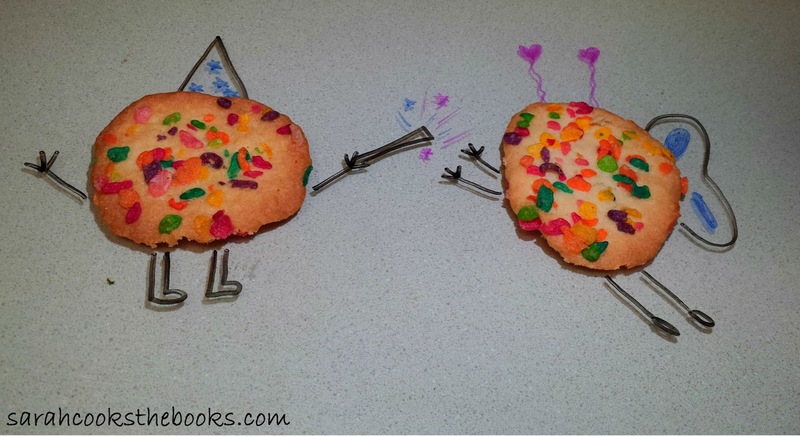 Flatten cookies out. The original recipe says to bake for 12-14 minutes. I had to bake them for 19. Again, they're Magical Fairy Wizard Cookies, so it might only take you 6 minutes. What do I know? What do any of us know? Carefully, carefully remove to wire racks and let cool. There's a good chance some of them will break. It's OK. Enjoy! If things around you start levitating, it's cool. Just have another cookie. It'll all be over soon. You guys, if you're reading this blog on a reader or a phone or something where you're not actually on the site itself, take a pause and go to the static webpage. 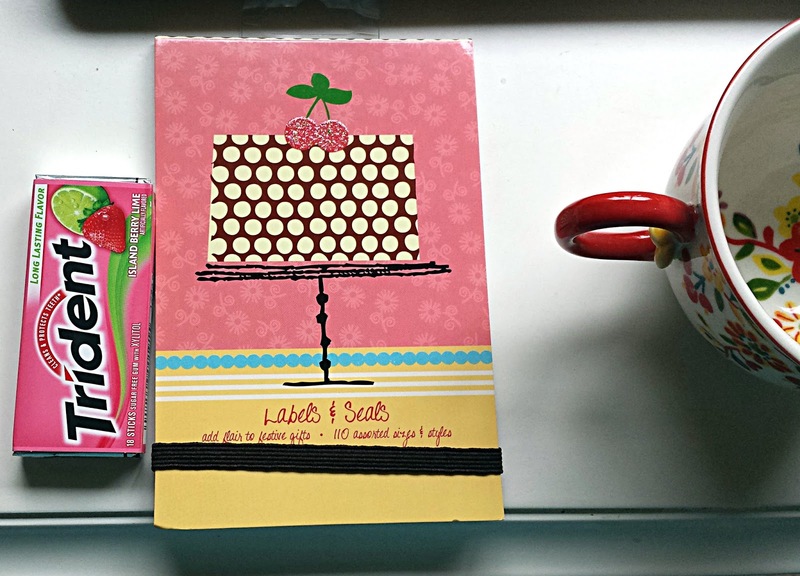 Angi of Angi Clark Designs did my new layout for me, and I'm madly in love with it. If you actually visit the site itself, you know that for a long time, I had a standard pink Blogger template, and then for the last couple of weeks, I had a weird "easy to install" free template that jacked everything up SEVERELY, and now I have a lovely, retro-looking very Sarah-looking blog that is just wonderful. One other new addition is the Sarah Cooks the Books button you can add to your blog if you're so inclined. Now that I have this awesome new design, I'm going to start keeping a lookout for buttons from blogs I love to add, so keep an eye out for that. I think that's everything new. . .take a minute and connect with me on your various social media outlets (God knows I have enough of them so everyone should have at least one in common with me!) If you're a Blogger user, you can also follow this page if you'd like. 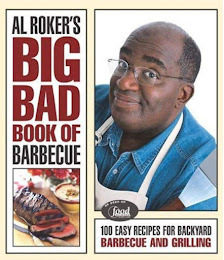 I'm so excited for this redesign and I'm looking forward to continuing my way through my huge cookbook collection. Thank you so much to Angi for the blog design, and thanks to you guys for continuing to stop by, even though I lie to you fairly frequently about when the next post will be up. Cheers! True Confessions: I don't like Doctor Who. I've watched two full episodes of it, and as much as I want to like it, I just don't. My BFF Andrea, and her girlfriend, Miranda, are HUGE Doctor Who fans. Huge. Like. . .cosplaying The Doctor at Dragon Con huge. A couple weeks ago, Miranda had a birthday, and Andrea asked Dennis and me to join them for a surprise birthday dinner. (The dinner wasn't a surprise. Dennis and me being there was a surprise.) I offered to make something for dessert (because, obviously), and Andrea told me Miranda's favorite cake flavor was red velvet, so that's what I had to work with. They're super-cute alien blobs of fat. Great for a cupcake, right? So I made some red velvet cupcakes and mixed up some Tardis-blue frosting. That's when terrible things started happening. I'd bought this cake decorating gun from Avon (back when I was pretending like I was good at sales) a couple of years ago, and it broke almost immediately, but was still usable. 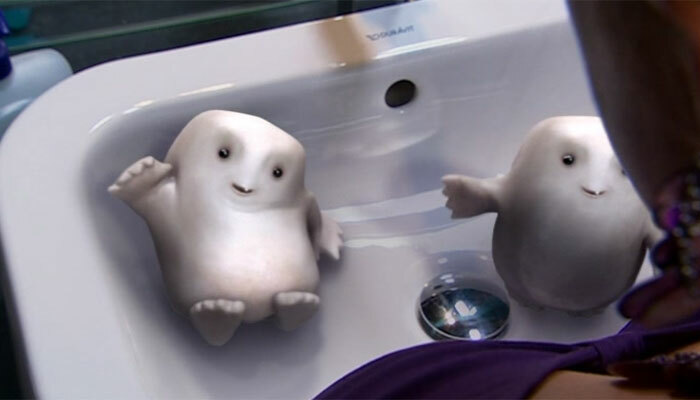 It stopped being usable whilst in the midst of Tardis-blue Adipose cupcake making. The frosting started leaking out the sides and making a big freaking mess out of everything. So that was a fun clean up. 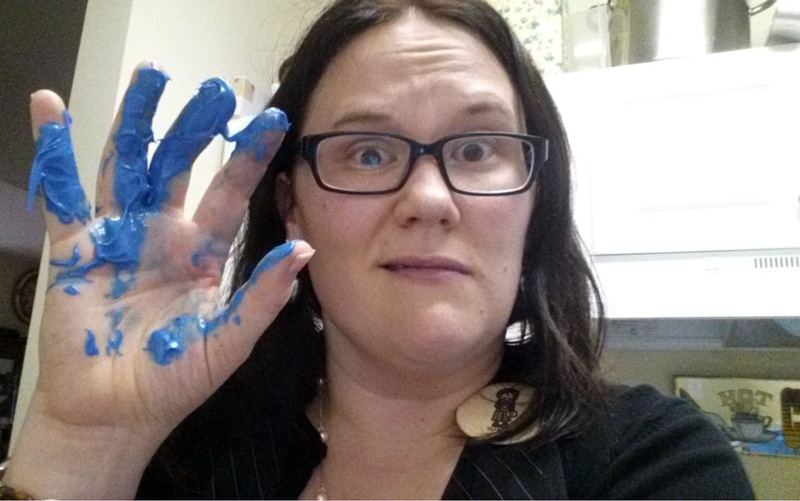 Did you know that Tardis-blue frosting is ridiculous to get off skin? True story. Since I still had cupcakes left to frost, I had to fashion a decorating tool out of the tip I'd been using and a plastic bag. 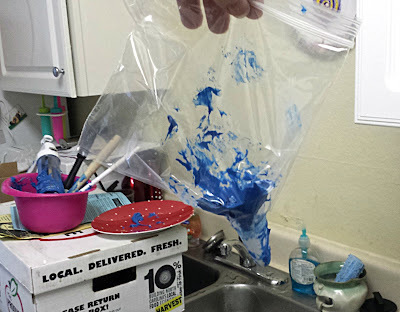 It leaked like crazy, and I ended up with EVEN MORE blue all over me. 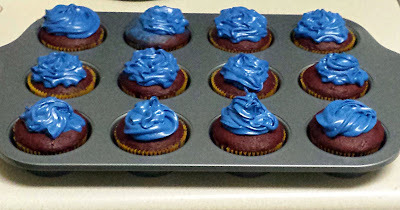 I wasn't able to take a picture of the ensuing massacre because I would have gotten frosting all over my camera. But I eventually got all of them frosted (if you ignore the one in the back that was where the gun falling apart happened. A little messy thanks to the malfunction, but there was about to be adorable Adipose (Adiposii?) on top, so it was OK. 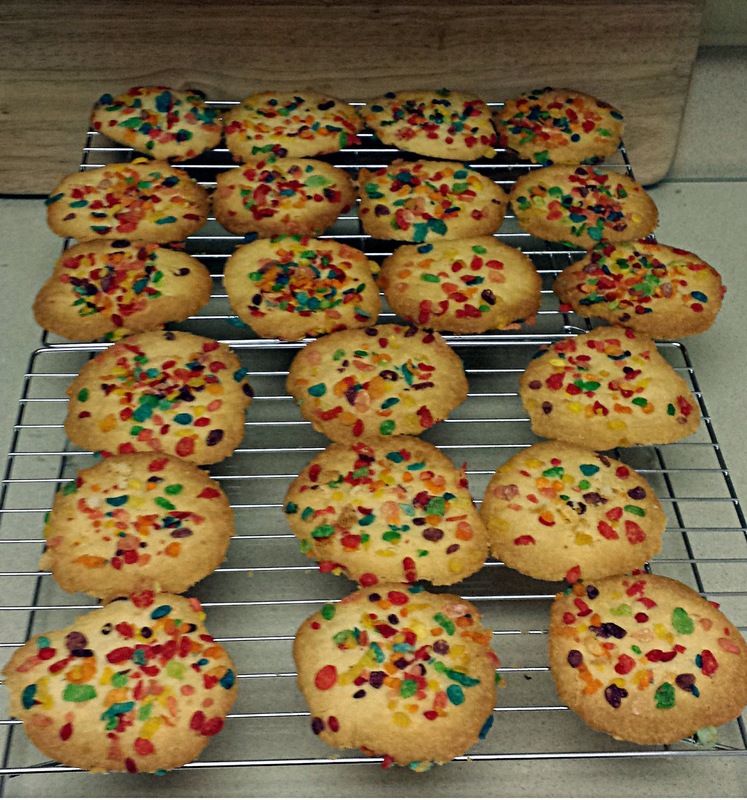 Since I was going for a Tardis-theme, I picked yellow and white jimmies to go on top. My original plan was to use toothpicks to hold them together. However, the toothpicks I had were too long, so I stuck on the arms and legs with corn syrup and stuck them in the freezer for a while to make them stick. 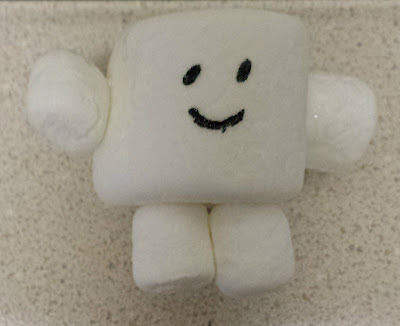 Since I was on a limited timetable, I don't think I let them set long enough (the appendages kept falling off as they thawed) so if you're making these, I'd recommend letting them sit for a while to make everything stick. 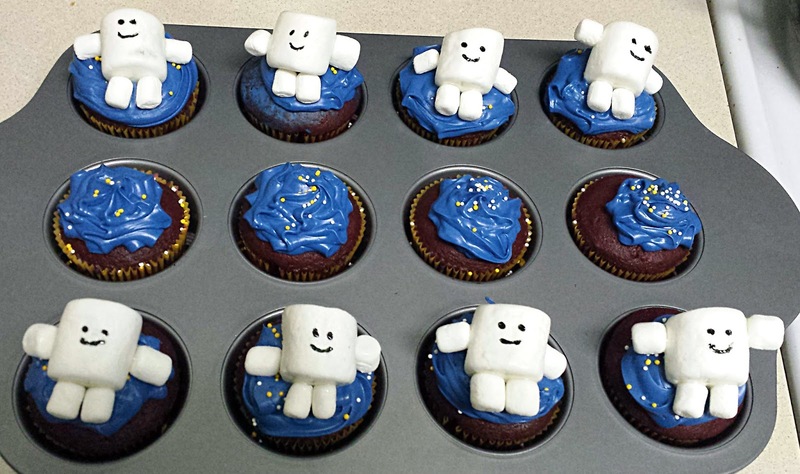 What I ended up doing for a lot of them when their limbs fell off was just sticking them back on in the frosting of the cupcake. I also drew on the face with a toothpick and black food coloring. They ended up being adorable. Cutest alien blobs of fat ever! They were finished on time and we made it to the restaurant in time to surprise Miranda for her birthday. She loved them and we were all buzzing on sugar for the entirety of the evening. I took part in A Cuppa Kim's 2013 Mug Swap this year, and it was such a cool experience, I'm already looking forward to next year! Full disclosure here: I think I did it wrong. She had mentioned in the rules that we could send along little treats to go along with the mug, but I didn't think much of it, and just sent the mug. . .and then I got a lovely package from Krissa at More Than Mundane and felt SO BADLY that all I'd sent was a mug. I'm sorry! I'll do better next year! 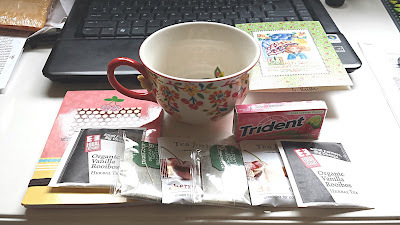 It was so great taking part in this swap, and I can't wait to do it again! As for recipes, the rest of the What Katie Ate recipes are forthcoming. We've got an instance where lemons almost ruined my life (again) and a great chicken wing recipe!